As I’ve mentioned before, growing up we pretty much ate non-sugared cereal or bagels for breakfast. On weekends, my mom would sometimes make French toast or German pancakes with apples and cinnamon and sugar, but things like cinnamon rolls and monkey bread were never a breakfast food for us. Then, during high school, I got a job at a Mrs. Fields bakery called La Petite Boulangerie. I opened the store every weekend morning and was there while the baker made the cinnamon rolls and sticky buns. What a delicious smell. And that was the beginning of my demise. That cinnamon roll is a weird shape? Guess we’ll have to eat it for breakfast. That sticky bun was a little too burnt? Save it to take home to my dad. 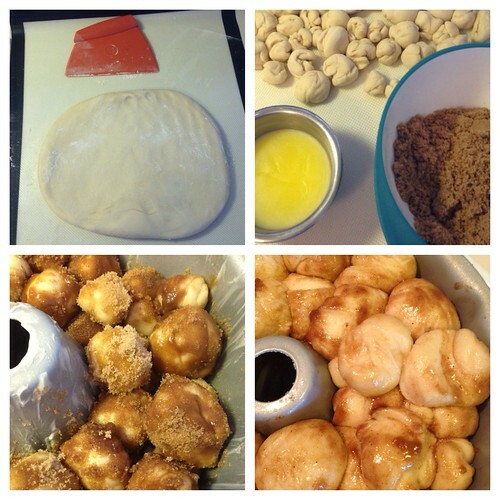 My love of sticky cinnamon and sugar began. 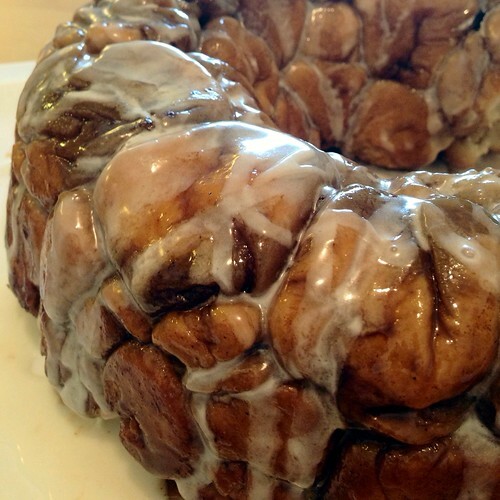 This monkey bread is similar to a sticky bun, minus the nuts, with a glaze. Since it’s 64 pieces of dough in a Bundt pan, it’s easy to tear apart and eat with your fingers, and sticky and gooey just like it should be. If you’re planning on making this, just remember it’s a yeast dough with two rises, so it does take a while to make but is so worth it! In a large measuring cup, mix together the milk, water, melted butter, sugar, and yeast. Mix the flour and salt together in a standing mixer fitted with dough hook. Turn the machine to low and slowly add the milk mixture. After the dough comes together, increase the speed to medium and mix until the dough is shiny and smooth, 6 to 7 minutes. If you think the dough is too wet (i.e. having a hard time forming a cohesive mass), add 2 tablespoons flour at a time and mix until the dough comes together (it should still be on the sticky side, just not overly wet). Coat a large bowl with nonstick cooking spray. Place the dough in the bowl and turn to coat lightly with the cooking spray. Cover the bowl with plastic wrap and let the dough rise until doubled, 1-2 hours (alternately, you can preheat the oven to 200 degrees, turning it off once it reaches 200 degrees and place the covered bowl in the oven to speed up the rising time). OMG’ I’ve just found your blog and it’s so sooooo amazing! Totally in love with this recipes! I’m from Brazil, and about a year ago i started cooking, and sweets are my favorites!